No landscape is complete without some masonry work. In fact, the concrete and other masonry elements become the base of many other features in the landscaping. These elements are also referred to as hardscaping features and they are part and parcel of the first phase of the landscaping project. 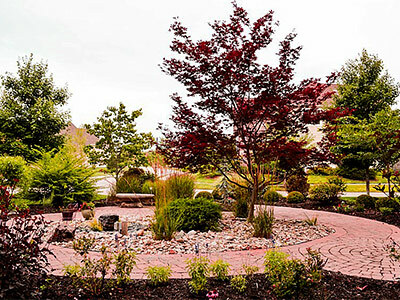 We at Mother Nature Landscaping are a full service company that has handled a number of small and large scale hardscape installation projects for customers in and around Bloomington, Martinsville, Mooresville, Bedford and Columbus. Over the years we have also catered to customers across Franklin, Seymour, Greencastle, Greenwood, Plainfield as well as Beech Grove. Since every landscape is different, the types of stone and brick installations that we build there will be different. We have over a decade of experience behind us and over the years, have designed and built a large number of masonry elements in residential landscapes. Natural stone is widely used in most landscaping projects and it adds to the elegance and uniqueness of the landscaping. Based on which setting and application they are going to be used in, you can choose from slate, sandstone, bluestone, flagstone, travertine and more. We have expert stone masons on board our team who have the skill and training to handle all types of outdoor custom stonework installations in the best possible way. We have successfully used natural stone in features such as retaining walls, boundary walls, edging and curbing as well as patios, decks and planter installations. Many of our customers also opt for natural stone fire pits and fireplaces. Even homeowners that prefer more inexpensive outdoor features, choose to get natural stone veneer installed on their concrete retaining walls, fireplaces and outdoor kitchen walls. While the upfront natural stone cost is higher than that of many other materials, it provides value in the long term. This makes it a very cost-effective option for any landscape feature. If you looking for experienced and reliable masonry and natural stone installation specialists, you need look no further than our company. You can discuss your project details with the specialists at Mother Nature Landscaping and we will provide solutions at very reasonable masonry cost. The number to call is - 812-339-5296. You can also contact us via this online form or request for a free consultation and quote via this form.